Pictures of the Kids and Fids! 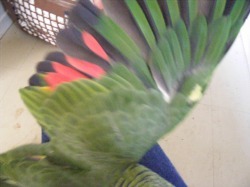 Maggie is a Red Lored Amazon, our biggest and most challenging resident Fid. Very little is known of her background. We are told that she was a pet store purchase three years ago, not a very friendly pet she was brought to us. She is a bird with a very complex personality. Based on the type of band she wears we suspect that she is one of the last import birds, originating from a quarantine station in California. 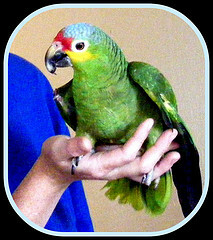 Importing birds was banned in 1992, this would make Maggie 16+ years old. She is a bird that wants to be loved, but fears. I suspect but cannot confirm that someone at sometime hurt her deeply. She must have been well cared for at one time though as her vocabulary is very sweet. Words such as I love you, thank you and Am I a good girl? She is not a plucker(whew...)but has an injury on her wing disabling her flight, though she has all of her flight feathers. We are making very slow progress with her but are very pleased. She seems to have also bonded to me and I am earning her trust. Our biggest goal is to get her in to the travel cage so that we can go and see the vet. Although not in any immediate danger and quarantined from the other Fids we still want to have that wing looked at! 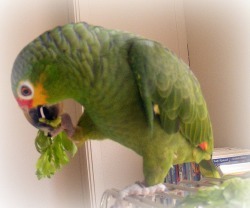 She also has a mild case of scissor beak, but this can be rectified. Maggie loves to sing but is seriously lacking in the tune department(don't tell her that though). Her progress is coming along great. She is still fearful and skittish, especially when I am folding laundry or covering her cage. 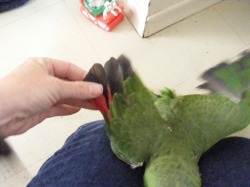 She will however now mouth my hand as opposed to crushing my fingers in her beak. A very large relief for me as it is getting harder to work at the computer after getting bitten so much. Lol! She thankfully loves her showers and has several each day so she is smelling a lot better than when she first came to us! We are continueing to work with Maggie and I know that we will eventually gain her full trust. Major progress today! Maggie tried to step on to my shoulder and allowed me to pick her up! She snuggled in my lap for about 15 minutes. Afterwards she preened my hair and held my hand. Bit me really hard(I think I startled her, my fault not hers). Was very confused when I walked away. Regurgitated on me when I came back, I walked away again. (We repeated this at least 5 times until she stopped regurgitating on me). Then the biggest step yet! She allowed me to examine her wings! My findings were perplexing and heart breaking at the same time. Somehow she has lost not just her primary flight feathers but that part of the bone as well. It is no wonder she has been so scared and mistrusting. This answers the questions of why her one wing is smaller and bumpier, why she has the large scab and scar, why she can not open that wing fully and lastly why she cannot fly. I can only imagine what this poor Fid has been through in her life. I can only hope that we are able to make her feel safe and secure and make the rest of her life a happy one. Today has been leaps and bounds for Maggie! This very afternoon she climbed up to my shoulder of her own accord. Mind you I can still feel the effects of her beak testing for stability. Ouch, my poor body is going to be black and blue by the time Maggie is done with me. (And I want to do this full time? Am I nuts?) Perhaps, but birds like Maggie didn't ask to be hurt of neglected. So I am doing my part for them. Even if it hurts a bit, the rewards will be many. I forget the pain every time she tells me "I love you" or "Am I a good girl?". Check back often for updates and pictures! I have recently discovered that the injury to Maggie's wing was in fact man made and deliberate. She has been pinioned. 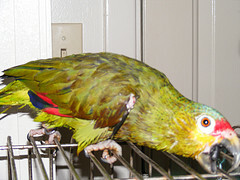 This practice was common among wild caught import birds prior to 1992. Confirming our suspicions of Maggie's origins. Why is the scab still present though? Does she pick at it when we are not looking? We will continue to find the answers! Wow! She is like a different bird! I can easily pick her up now without getting bitten. I can towel her with a white sheet or towel. Dark colored fabric however still panics her. We can go outside on the lawn and she will follow me around like a little duckling. We sing together(she really like weird al's ebay song off of you tube). She still tries to regurgitate for me and is now shredding paper(trying to make me a nest). I am flattered. (Seriously though we are trying to discourage that behavior). She actually started chewing on a toy and now plays with it regularly. I am just so pleased with her progress. She is really starting to trust me! She is not as trusting of others but has a good verbal relationship with the kids and the Hubby. Will sing and take food from their hands as well as allow them to scratch her itchy spots. I think that we will soon be able to coax her in to the travel cage for that check up! I want to thank you all for the encouraging comments and advice. Thank you for following us, and check back for more updates! Well she finally did it! We were snuggly and playing the other evening before bed. I was pretending to sleep and she was preening my hair. Then out of the blue she stepped up on to my arm so that she could reach my hair better. She allowed me to stand holding her there as well, then she bit my ear (ouch). It comes with the turf though, the price I pay so to speak. It is very rewarding though to see how happy Maggie is here. She is a fan of Weird Al Yankovich and sings along to his ebay song. I am amazed by her progress! Well Maggie finally has a favorite type of toy! She/He likes to untie knots! She was terrified of toys when first coming to us, this is a big step!